Across Christianity, we hear of being saved by the Blood of Jesus. I was flipping through the TV last night and heard a televangelist leading a prayer, calling the audience to believe in being saved through the Blood of Jesus. It got me to thinking, what exactly to Protestants mean when they say this? If Protestant Christianity and theology rejects the Real Presence (Lutherans and Anglicans aside), then how and when are Christians saved by the Blood? In Orthodox Church, we are saved by the Blood as attested by the Scriptures through the Holy Communion. We are quite literally saved by His literal Blood. How does Protestantism explain this process? Is it just symbolic? How and when are folks saved by this Blood? At Baptism? At the Second Coming or Judgment? I am a bit confused by the ambiguity of the statement, perhaps some of our resident Protestant folks could help me out and explain what the Blood of Jesus means to them? What do hymns like "Nothing but the Blood of Jesus" actually mean in day to day life? Blood sacrifice, blood atonement. He shed His blood on the Cross and died in order to satisfy the justice of the Father and impute onto fallen humanity the righteousness He earned through His sinlessness in order to save them from the eternal damnation that was their due following the fall of Adam. Across Christianity, we hear of being saved by the Blood of Jesus. I was flipping through the TV last night and heard a televangelist leading a prayer, calling the audience to believe in being saved through the Blood of Jesus. It got me to thinking, what exactly to Protestants mean when they say this? If Protestant Christianity and theology rejects the Real Presence (Lutherans and Anglicans aside), then how and when are Christians saved by the Blood? In Orthodox Church, we are saved by the Blood as attested by the Scriptures through the Holy Communion. We are quite literally saved by His literal Blood. How does Protestantism explain this process? Is it just symbolic? How and when are folks saved by this Blood? At Baptism? At the Second Coming or Judgment? I am a bit confused by the ambiguity of the statement, perhaps some of our resident Protestant folks could help me out and explain what the Blood of Jesus means to them? Really , I was just talking to him today. And He answered a prayer of mine from last week today. In all honesty I understand what your saying and all joking I side I'm inclined to agree with you, we have a Savior who desires all to be with Him so it will be as He says and that enough for me. Christ's blood was a propitiation(or expiation, if you will) for the sins of mankind. In ancient Hebrew religion, the blood of the sacrificed animal would be sprinkled on the mercy seat. The blood of the animal was shed(and likewise its flesh consumed) to atone for the sins of the Hebrews. This was all a foreshadowing of Christ's ultimate sacrifice, where his blood was shed for the forgiveness of mankind's sins. This is the "penal" theory. It can also be said that Christ's blood was the price of our ransom for sin. 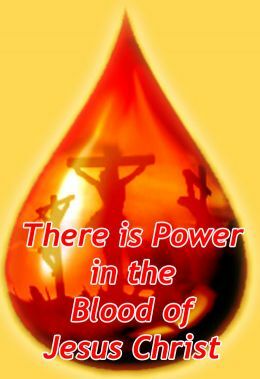 It can also be said that we are saved, literally transformed, when we drink Christ's blood(blood is life, so drinking it imparts his life into us), as you have stated above. All explanations are in my opinion perfectly Biblical and "valid"(I know you folks don't care for that term), but incomplete in and of themselves. The different models of atonement all complement each other to present a bigger, more complete picture. This is perfectly Biblical and I don't see how anybody can object to it. Provided, it's an incomplete explanation in and of itself, as I've stated above. 2 Corinthians 5:18-21:"And all things are of God, who hath reconciled us to himself by Jesus Christ, and hath given to us the ministry of reconciliation; To wit, that God was in Christ, reconciling the world unto himself, not imputing their trespasses unto them; and hath committed unto us the word of reconciliation. Now then we are ambassadors for Christ, as though God did beseech you by us: we pray you in Christ's stead, be ye reconciled to God. For he hath made him to be sin for us, who knew no sin; that we might be made the righteousness of God in him." what exactly to Protestants mean when they say this? Without going into the more specific theological differences they have with Orthodoxy, they mean that it we are saved from sin and death and reconciled to God through the death of His Son. Generally speaking without getting into the why/how theological differences between us, we believe this too. You do have one point with the sacraments, where we tie Christ's death (and resurrection) into the sacraments as a means of actual participation in the Paschal Mystery, they do not (generally speaking). This might shed some additional light on it. Since Jesus was about to defeat death and the man would be raised from Hades like everyone else who died before Christ's crucifixion and shattering of death. Kind of odd that Protestants would say that Jesus died to satisfy God's wrath when in the Old Testament God actually condemned people for sacrificing their children to strange gods. Seems odd that He would go around and do the same. Thank you for this, along side with your insights about moral relativism and peace from war, you've been on a roll of powerful reflections young brother, keep it up and speak the real. How we are justified by His Blood is debatable. As has been asked about the Thief on the Right, or any of the Old Testament Saints, how are they saved? I would say they were saved by the Grace of God, but I'm not sure exactly it was the Blood. They can be saved aside from His Blood, but by His very Grace. He is not limited by His Blood or any other methods, if He chooses to save any soul that is entirely His business. In the Orthodox approach, we can only be concerned with our own individual sins, not the potential or rhetorical sins of others. So for us in our lives, we are Orthodox, and we are saved by His Blood in the Holy Commmunion, so then quite literally. Agreed, but we might suggest that this Blood is the Holy Communion. This is a reference to the Holy Confession, which is called Reconciliation, hence while Apostle Paul specifically mentioned it as "the ministry of reconciliation." This is the crux of the entire difference between Orthodox and Protestant readings of the Scriptures, many Protestant thinkers read the Scriptures to discredit Sacramental Christianity, and yet all Sacramental Christians precisely find all of the Sacraments in the Bible! Thank you for those folks who shared, this has been something I have been thinking about for a long time, and even if I may disagree with some of y'all, I can quite respect and appreciate your own views, and am happy that you feel comfortable sharing them with us. I would hope not, isn't the OO one of the earliest Protestants to leave the church? You guys rejected the 4th ecumenical council correct? Western Protestants left over clear abuses by Rome. Huge difference. The OO didn't leave the Church the way Protestants broke with Rome, they simply refused to accept the Fourth Ecumenical Council and this caused a schism between the two groups. Right, OO left over Dogma, the west was kicked out for standing up to clear abuse, murder and torture. No, the point is that the Reformers left Rome. The OO were simply those who didn't accept a new Ecumenical Council - i.e. they stayed where they were. Luther was excommunicated for standing up against clear abuses. We never left the Church, we *ARE* the Church. The Byzantines are the ones who left the Church. Likewise, we also had to deal with imperial abuse, murder, and torture (probably a lot more so than the Protestants). Protestants were members of the Roman Catholic Church and consciously left that church because they disagreed with its teachings and practices. While I believe the OO to have been on the wrong side of the Chalcedonian dispute and the resulting schism, they did not protest against what they regarded to be the established Church, nor did they consciously leave that Church, but rather saw themselves as the continuation of the Church who faithfully preserved its existing teachings and traditions. Their situation is not analogous to that of the Reformers. saw themselves as the continuation of the Church who faithfully preserved its existing teachings and traditions. Isn't that the reason for every sepreration in the church? No. If I understand correctly, Luther and other Reformers were trying to remove and undo the existing teachings and traditions of Roman Catholicism and replace them with their version of what the original supposedly was. They were clearly not trying to preserve anything that was then existing. No, Protestants were kicked out for standing up to clear abuse, murder and torture within the Western church. Or should I say Protestants were kicked out for the illegitimate ways they stood up to abuse, murder and torture within the Western church, often by perpetuating against Rome the very same abuse, murder and torture Rome initiated against them. Enough of this Chalcedonian/Anti-Chalcedonian polemic. That goes for all of you. If anyone wishes to continue this digression, please start a new thread or resurrect an existing thread on the EO/OO Private Board. Thank you. Habte, the act of Christ shedding his blood is a product of His Grace. Christ's blood is propitiation for our sins, that includes those under the Old Covenant. I would say that reference to Christ's blood is a shortened way of referring to the shedding of his blood, thus to his death. This was pre-figured in the Old Testament sacrifices, from Abel onwards. It has often struck me that even some pagans, despite getting it grossly and tragically distorted, retained a memory of the fact that "without the shedding of blood there is no remission of sin," and practised not only animal but also human sacrifice. If we trust Christ, and truly repent of our sins, we are saved because the shedding of his blood was the propitiation for our sins: it quenched God's wrath, satisfied his justice, was the death I as a sinner should have died. I think that Orthodox need to realize that legal and banking terminology (e.g., "forgive us our debts...") is biblical terminology. At the same time, however, a strict understanding of penal substitution (that Christ dies to satisfy God's honor (Anselm) or wrath (Calvin/Luther) is unOrthodox. But, again, that's just my opinion. Well, even Romans 5:9 says that Christ saves us from God's wrath. The key is understanding what "wrath" or "justice" means in this context. If by "wrath" or "justice" we mean that God has a petty human sense of honor that needs to be satisfied in a spirit of hateful vengeance, than this is unacceptable because God transcends such human pettiness. The justice of God is not a justice based upon human needs for revenge, rather it is a justice which ultimately leads to the goal; the salvation of man. NicholasMyra told me that Saint Athanasius lays out his teaching concerning God's "Divine consistency" in his exhortation against the heathen, and it seems to be -from what I have been told- consistent with what I was taught growing up as an OO. Am I on to something here, or do you think I am off base? Your emoticon is shocked. Can you tell me why? As far as I am aware, what I wrote has been taught, in the West at least, from at least as long ago as Anselm. The hymns are full of this teaching, from both the Arminian and the Calvinist wings of classic Protestantism. "πολλῷ οὖν μᾶλλον δικαιωθέντες νῦν ἐν τῷ αἵματι αὐτοῦ σωθησόμεθα δι’ αὐτοῦ ἀπὸ τῆς ὀργῆς. (Romans 5:9)"
Σωθησόμεθα is future tense, not past tense. If the wrath would have been appeased at the crucifixion St. Paul wouldn't have used the futurum. Yes but the issue here is more about us as Orthodox judging others worthiness of being saved, And as you just said , God will save who he will, but more importantly we will be judged as we judged them, so that is what I am saying is wrong, just as the workers were all paid thje same even the ones who only worked a few minutes like the thief, but the others complained that that was unfair, but the farmer who hired them said who aqre you to tellme what is fair for them when you agreed to work all day for the wage when I HIRED YOU. But here we see Orthodox telling Protestants what the farmer wants , God will say who are you to tell him that. Please forgive me, I am not trying to draw any lines in that sand about who can be saved and who can't, neither am I suggesting that folks can only be saved through the Holy Communion. Rather, I am asking a specific question about what the Blood of Christ means and represents to Protestants considering that they consider the Holy Communion only symbolic. I do not intend to judge anyone, I just am wondering what folks mean when they refer to the Blood of Christ, and so far the representation has suggested atonement/penal theory. I am asking a specific question about what the Blood of Christ means and represents to Protestants ... what folks mean when they refer to the Blood of Christ, and so far the representation has suggested atonement/penal theory. These two quotations seem to me to identify a bifurcation in the discussion: Hebte Selassie is asking what we Protestants mean in our day-to-day, somewhat elliptical parlance when we speak of having been saved by Christ's blood; the second quote is replying to a different question, perhaps along the lines of "What did Paul mean by being justified by the Blood but saved in the future?" I think we need to unravel a number of strands here. 2) The verse Romans 5.9 refers to a past justification and a future completed salvation. I shall not go deeply into this here, as we have debated it at length, repeatedly, and very recently on other threads. I simply place the reminder that we Evangelicals do tend to use the word "saved" to denote the past aspect of salvation, which Paul here calls being justified; we do not deny the ongoing and the final completed salvation, but we tend to use words like sanctification and glorification. 3) Habte Selassie has correctly discerned that when we speak of the Blood of Christ, we are thinking not of the holy housel, but of our Lord's death at Calvary. We Orthodox and Protestants mutually agree about justification and interpretations of Romans 5, however we have an entirely different ontology about Salvation in the first place. We in Orthodox can't accept Penal Substitution or Atonement theories because they are too legalistic for our tastes. Further, we feel that they stem from an entirely different conception of what sin is. In Orthodox death resulted from sin not inherently as a vindictive punishment, but a natural consequence, almost biologically speaking. God warned us, "You shall die," however He didn't implicitly say, "I will vindictively kill you." So in Orthodox, we do not perceive of our own individual or collective human deaths as being a personal punishment as a result of some vendetta by God, rather, it is the mechanical consequence of sinning. If A than B kind of reasoning. In Protestant thinking that supports Penal Substitution, the idea is that God punishes people with death, with suffering, and that Christ was bearing our own personal and individual punishments. We can't dig that in Orthodox, Christ suffered for human nature, not necessarily individual humans. It is in the cosmic sense, a macro vs micro analysis. Even in the Old Testament, animal sacrifice was atoning for covering sins, not having the animals bear our punishment instead of ourselves. I like the way you put it, elliptical parlance, we can dig that, however, in our theology because of the Real Presence we are not just commemorating or remembering as in Protestant thought, but a metaphysical reality. We join Christ's sacrifice on the Cross literally, dynamically, powerfully, and we relive this moment when we participate with His Holy Communion. Are there any Protestants here who disagree with Atonement/Penal Substitution and feel differently about the Blood of Christ? Another thoughtful and lovely response. God sacrificed his Son to a strange god?